After the trade with the Dodgers, we are looking at a very fun group. Cincinnati added Yasiel Puig and Matt Kemp, giving them two right-handed bats that will benefit from hitting in Great American Ballpark. Puig will be more of an everyday guy, where Matt Kemp might platoon against left-handed pitching. This is all in addition to Joey Votto, Scooter Gennett, and Eugenio Suarez. All have been excellent options at the plate while in Cincinnati. This is going to be a talented offense, especially with Jesse Winker leading off. His on-base skills were a hit before the injury late in 2018. Scott Schebler is the other name to mention, who is more of a boom or bust power threat from the left side of the plate. Expect some high scoring games on both sides when the Reds are on the slate. Things are starting to improve in Cincinnati, and that even means the rotation. Luis Castillo found himself in the second half, and they added Alex Wood and Tanner Roark to be middle of the rotation arms. While these names might not be upper tier pitchers, they are a massive improvement from Homer Bailey. As mentioned with Castillo, he pitched 170 innings last season, and had a 3.69 xFIP. There were two different halves for him, as he allowed a .341 wOBA in the first, compared to a .268 wOBA in the second. Castillo was hyped up heading into the season, and his second half was an indicator of the future, which is a bright one. The Reds trade with Los Angeles brought over Alex Wood. The lefty will get a downgrade moving to Cincinnati, but there is a lot to like about the groundball arm here. He should eat a decent amount of innings, and has been great at limiting damage. Wood should have a productive year as the number two in Cincinnati. He is projected for a 3.34 ERA, and is also an accurate arm who doesn’t give up a lot of baserunners. The Reds signed Tanner Roark, who is an innings eater, and average right-handed arm. He is nothing special, but nothing special is a decent add for the Reds. Roark came over from Washington, where he had over a four ERA. Look for him to be around the low fours for an ERA, and put together some stretches both good and bad. Things start to get rocky after this, as Sal Romano and Anthony DeSclafani will likely stay in the rotation. 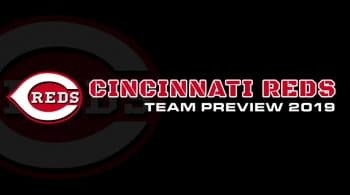 There is a chance that Tyler Mahle or Michael Lorenzen mix in, but at the moment they should be the guys filling out the rotation. You are going to get some random good starts out of these names, but for the most part they are below average arms who do not offer up a lot of upside. They are fill-in options in the meantime, as Cincinnati looks to the future. They have Hunter Greene in the waiting, but 2020 is likely going to be his ETA. Mahle is a top prospect for them, but we haven’t seen much yet.